Moldova appears to be the “best pupil” of the class of six contestants to the EU integration, if we have to judge by the European Partnership Index (EaP Index). However, given the nature of the recent political crisis in Moldova, we have all the reasons to question the legitimacy of Moldova’s smooth image on its road to Europe. Leonid Litra, from IDIS “Viitorul” and Moldova expert for EaP Index, delivers his view of Moldova’s path to Europe, few months before the 2013 EaP Index, foreseen for April or May. CARTIER EUROPEAN: How do you evaluate Moldova’s chances to further progress on EU Integration in case the governing Alliance for European Integration made up of three democratic parties is dismantled? I think that overall the chances remain the same, at least on the side of the EU. Moreover, the commitment of the Moldovan government is not only the commitment of the politicians, but also the commitment of the country. I think that a possible new alliance with the involvement of the party of communists would slow down the reforms towards EU integration. In addition, until a new alliance is set up, in case the current one falls apart, there will be a slow down in the implementation of the needed reforms. Therefore, it is important that Moldovan opinion leaders, experts and intelligentsia require from the new alliance (if this is the case) to continue the previous commitments on the Association Agreement, DCFTA, visa liberalization, etc. Another element that makes us think that the possible future alliance will be pro-European is the fact that the EU provides Moldova with many financial resources needed for reforms and Chisinau has no other alternative sources to them. CARTIER EUROPEAN: In the 2012 European Partnership Index (EaP Index) report it was mentioned that the judiciary reform was delayed for a number of reasons. The recent scandal over a hunting incident “Domneasca-gate” with high-ranking judiciary involved in it shows that little has been done since last year in that sector. How do you evaluate the reaction of the governing political parties’ leaders to the late revelation of the incident by those involved? I think that incident is one of many that take place, most probably, every day in Moldova. The main problem is that all the parties were using the incident from “Padurea Domneasca” for political reasons. One can see that since the peak of the political scandal, on this particular case nothing important happened. The party of prime minister Vlad Filat needed such an incident to weaken the position of its coalition partner – Democratic Party and especially of its deputy, Vlad Plahotniuc, who, apparently, had nothing to do with this particular case but was anyway linked to this issues and finally dismissed. On the contrary, a good sign of political parties’ behaviour was that the general prosecutor was dismissed by the Parliament with an absolute majority of votes coming from all parties and the report of the special commission was also voted unanimously. However, as one can see these days, nobody really cares about this case, since the real stake was other than the declared one. In the same context, I doubt that what happened in Moldova (dismissals, hearings, etc.) would have happened in any other EaP country, maybe except Georgia. CARTIER EUROPEAN: In the same vein, the “raider” attacks were pointed out by the last year EaP Index report. Is there any progress on that file? The progress is that the legislation was improved in order to prevent this kind of raider attacks to happen again. Moreover, the judges who were involved in “facilitating” raider attacks were removed from the judicial system, which is a good sign for the rest of the judges who might have had temptations to involve themselves in such “activities”. However, this is not only the problem of the judicial system in itself, it is also about the political support some of the judges have and which makes them feel confident that they will avoid sanctions. 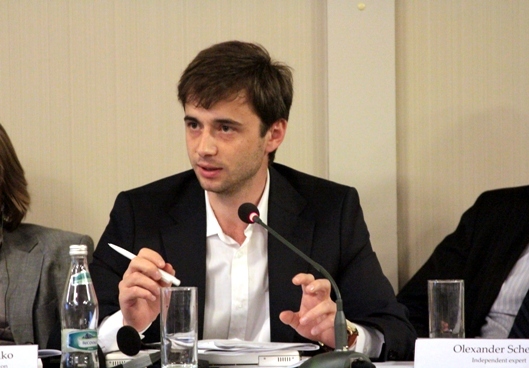 CARTIER EUROPEAN: How do you appreciate the creation of the Office for Relations with Diaspora in Moldova? Is that of any use when there are so many problems to be solved in the country itself? I cannot say too much about this office since it has only been created. Nevertheless, there will always be problems in the country. In spite of that Moldovan citizens abroad need assistance and help from their motherland. Let us not forget the fact that a large part of the Moldovan GDP is composed of the remittances sent by Moldovans who work abroad. Therefore, they deserve more attention form the state. Now we will see whether the Office [Relations with Diaspora] will be able to meet their expectations. CARTIER EUROPEAN: A report on Soviet mentality published by IDIS “Viitorul” in Moldova suggests, among others, that a lustration law could help to change mentalities. Could you explain why exactly that can be one of the vehicles of mentality change? Don’t you think it is too late to introduce such a law? The lustration law alone cannot be a vehicles of change. That is why the authors suggest several recommendations on how to get rid of post-“Sovietness” that is interconnected. As mentioned in the book, it might be true that it is too late for a lustration law, which ideally might have been adopted after the collapse of the Soviet Union. However, there is a feeling that Moldova has to do something in order to reframe the moral layer of its political class and one of these is the lustration law. Half of this process has already been done by condemning the crimes of communism regime in Moldova and the prohibition of its symbols. There are still things to be done.